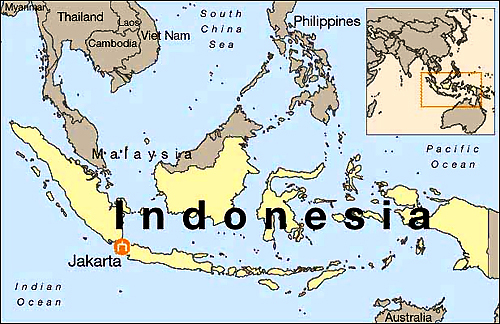 Indonesia celebrates its sixtieth anniversary later this month. Throughout its short history, this predominantly Muslim country has struggled with extremist elements. Last week a group called the Indonesian Ulemas Council (MUI) issued a fatwa denouncing Islamic interpretations based on liberalism, secularism and pluralism. Among the practices targeted are mixed marriages and joint prayers with people of different faiths. While the fatwa has been met with strong criticism and condemnation by Muslim scholars and clerics alike, MUI still exercises a large influence over certain sections of Indonesia's Muslim community. 88% of Indonesia's 241,973,879 population are Muslim. Three weeks ago, some 10,000 people from a Muslim group calling itself the Indonesian Islamic Community attacked the Ahmadiyah Indonesia Congregation (JAI) Campus in Bogor, 2 hours south of Jakarta. The group claimed to be inspired by a 1980 fatwa issued by MUI declaring Ahmadiyah's teachings, which recognize its founder to be the last Muslim prophet rather than Muhammad, to be heretical. Ahmadiyah is little known in Indonesia and there are only an estimated 200,000 followers in the country. The incident has sparked intense debate throughout Indonesia. Founded in 1975, MUI was used as an extension of state policy during the so-called "New Order" period of former dictator Suharto. Although its foundation was engineered by Suharto, and it continues to be funded by the government, MUI is not a statutory body anchored in law, but an independent non-governmental institution. Its fatwa are not legally binding. When Suharto's regime collapsed in 1998 and the current period of "Reformasi"(reform) began, MUI's role had to be redefined. Many see its inability to adapt to changing realities as a reason for their increasingly conservative and zealous positions. Indonesia prides itself on tolerance and "unity in diversity" adorns its coat of arms. However, ethnic conflict and extremism has too often broken through to the surface. The current administration of President Susilo Bambang Yudhoyono (SBY) has been accused of being too timid in its reaction to the MUI fatwa. While they condemned the attack, the government also considered outlawing the Ahmadiyah for causing public disorder. "Our main concern is public order. We don't care about the content," said Attorney General Abdul Rachman Saleh. The government also fears that legitimate measures to stamp out extremism will be seen as appeasing western powers such as Australia and the U.S. In the absence of strong government action, scholars and activists grouped together as the Democratic Education Association have spoken out. This week they issued a joint statement condemning the MUI for undermining the principles of nationhood and democracy. They also urged the President's administration to be proactive in upholding pluralism. One prominent Muslim scholar, Azyumardi Azra, told the Jakarta Post this week that the MUI was issuing fatwa without consulting relevant Muslim figures or complying with fiqih, or Islamic jurisprudence. "The MUI cannot ban Muslims from thinking," he said, "because pluralism, liberalism and secularism are not ideologies but ways of thinking. To some extent, the MUI's fatwa are against freedom of expression and human rights in general." M. Bilah of the National Commission on Human Rights agreed, saying the fatwa constituted a violation of human rights.